And with the changing of the seasons comes my twice yearly attack of the senses. This October was no different from the rest, fall allergies flared up right time, then somehow turned into Bronchitis. I am on the downward spiral of it thankfully. So I guess it’s time to catch you up on the goings on here. Mostly it’s been the weekends that have been chock full of friendly goodness. The first weekend of the month my friend Glenn and the Improv group he belongs to (which I blogged about here) brought the show on the road for 2 night’s to Connecticut. So I did what I do best, rallied the troops and brought 7 of my good friends (and one friends daughter and mother) to the Saturday show. It had to be one of the best show’s I have seen them do. 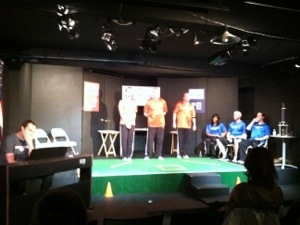 The crowd was great the improv players were on the ball. A good time was had by all. They performed at the Carriage House Arts Center, which gets its name from the fact that it was at one time the carriage house for a Mansion that still stands on the grounds of Cranbury Park. The following week I had the pleasure of attending a Benefit a good friend of mine was in charge of for the Leukemia & Lymphoma Society local chapter called Rock for a Remedy. The night consisted of 2 local bands who donated their time that night to perform to help raise money for Team Berlin and the Light the Night walk. It’s not too late to donate! 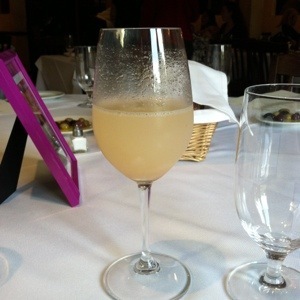 The event was held at a great little restaurant in White Plains NY called Vintage Bar. Aside from the Hubby and I, there were some of our other friends who joined in the festivities. The place was super cute, the food was fabulous, the company was amazing and although I didn’t win any of the raffle prizes we still enjoyed ourselves. 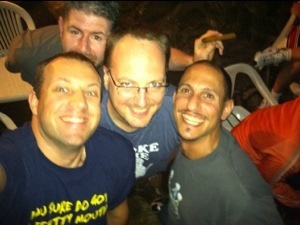 This is our friend Mike, half of the couple who hosts the monthly Gayme Night we attend. 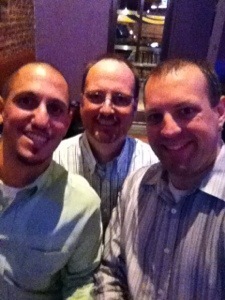 Which we attended just 2 days after the other night out. Another fun night and another disturbing game of Cards Against Humanity was played. Last Friday (seems like it was just yesterday) we got together with some other friends to go out and partake of a local restaurants Oktoberfest Menu. This is actually the same place we go to for our monthly Gay Social Night out on the first Monday of the Month. The new owners have been fabulous and the menu looked quite interesting when we first saw it. Half of this couple is of German descent so it was going to go one of 2 ways, really well or really bad. Thankfully everything we ordered was delicious and our friend was surprised at how authentic it was. 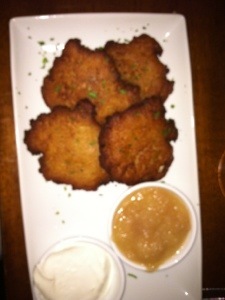 This was my starter – Potato Pancakes with homemade applesauce and sour cream. 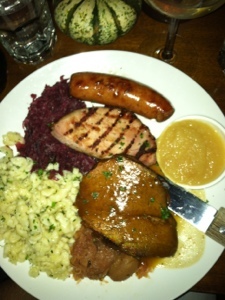 Sauerbraten, Grilled Pork Chop, and a Wurst with Spaetzle and Red cabbage. That brings us to the current week. Pretty uneventful so far. Looking forward to date night tonight with the hubby. Tomorrow night we have a halloween party at my uncle’s house and I guess some preparedness to do for Hurricane Sandy (not to be confused with our Greyhound Sandy). This is the 2nd year in a row Halloween weekend/week has been plagued by weather. Last year was the freak blizzard we got. Now on to a more serious topic. This past monday was the annual Election of offices at Drum Corps. Surprisingly to me I was not elected to be Drum Major again this year, the members decided they wanted the old guy I took over from 3 years ago. So I stand at a crossroads both in life and with the blog. I think I will be going back to playing the Bells for the corps again and making a difference in the music we play, my other option is to join the ranks of the retired and crazy and carry a flag. So that just leaves the blog. Since I am no longer a drum major should I consider changing the name of the blog? If so I think I will need to create another blog with a different link through WordPress and import all of these posts (or not and just start fresh). So those of you who have been through this let me know your thoughts either via email or in the comments. And if you know me well enough (either through reading the blog or twitter) and have a recommendation on a new blog name let me know. I will consider most options. And now back to your regularly scheduled programming. I think I have avoided work for long enough this morning. As it is it took me an hour just to type this up since work kept getting in the way. I wish I could say there have been some beautiful sunrises and sunsets but the weather has been rainy and foggy for days. It is supposed to break I think tomorrow but then I get my weather info by looking out the window. When we last left I was waxing poetic about my ten year anniversary of my cancer surgery. So let’s get things back to an upbeat tempo. Drum Corps marching season has come to a close, and rehearsal season is in full swing. 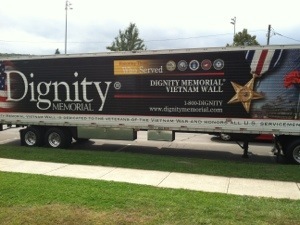 On Sept 22 we had the honor of performing at the Dignity Memorial Vietnam Wall. 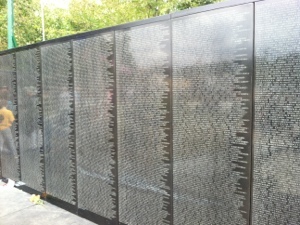 It is a 3/4 replica of the Vietnam Memorial Wall in Washington DC. 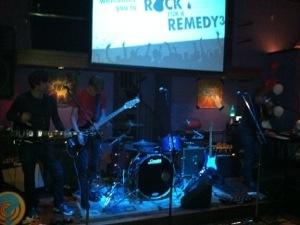 We performed 4 songs prior to the opening ceremony for that Saturday. 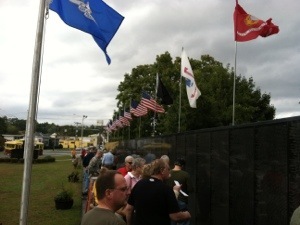 Some pictures below are ones I took of visiting the wall later in the day. 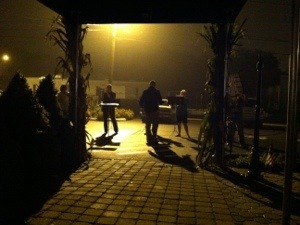 Later that evening we were invited to a friends house for what he has dubbed Septemberfest. We had fun just hanging out and eating and chatting around the bonfire. And of course silly pictures were forced to be taken. Last weekend was the final performance for the drum corps for the 2012 season. 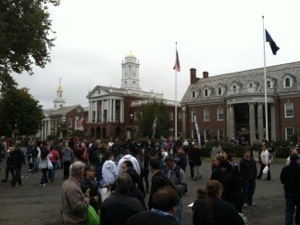 We boarded a bus at 8am and drove 2 hours north to the Eastern States Exposition or The BIG E as it is referred to. 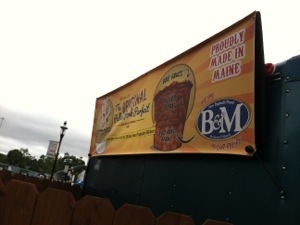 This is an annual Fair that takes place for roughly 2 1/2 weeks in September. Each day is dedicated to a different state or group. The fairgrounds are permanent and the main strip contains replicas of the State Capital Buildings from the 6 States in New England. To give you a gauge of how popular the fair is Opening Day Sept 14 had 68,533 people in attendance, closing day Sept 30 had 77,705 people in attendance. The lowest attended day was Tuesday Sept 18 with 13,424, the Highest attended day was Sat Sept 22 with 164,281 people in attendance. The day we attended there were 101,477 people there. 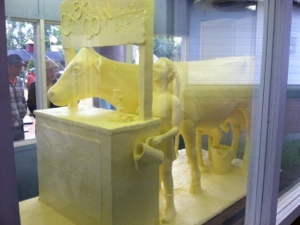 Another must see item at the fair is the Butter Sculpture. 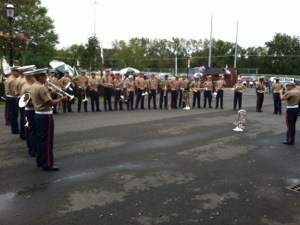 I managed to get a picture of the Marine Corps Band that was there the same day. Aside from spending the day there eating and shopping for fabulous as seen on TV stuff, we were there to march in the 5pm Mardi Gras Parade. The crowd the entire parade route had to be 10-20 people deep for the entire 2 miles. It was a good way to end the season. My Lunch was this fabulous dish. Pulled Pork Parfait. Baked Beans topped with Pulled Pork and BBQ Sauce. After a couple months off we started back up with our Rotating Brunch get together. This time we made it a field trip to a local restaurant that does a pretty good Sunday Brunch. 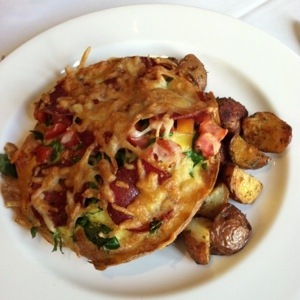 Aside from the never ending Bellinis I had the Frittata special. It had spinach and was topped with hot sopressata and cheese. The socializing spilled into sunday night with a small get together at a friends house, then the Monday night Social group. Last night was Drum Corps rehearsal and while the Fifes and Bells were outside during sectional rehearsal I snapped this pic from underneath the arbor listening to them. The streetlight and the fog make this whole picture.